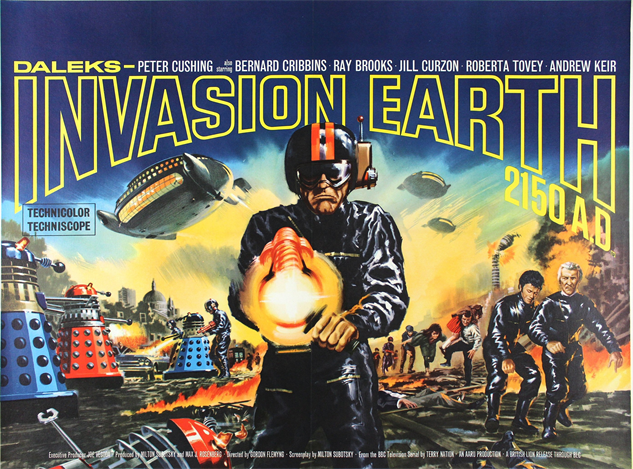 Daleks-Invasion-Earth:2150 AD, is an enormous improval on the preceeding film. It is more exciting and enjoyable and there is an impending sense of fear throughout the movie wich was evident in the Television series around this time. Peter Cushing gets to grips with his role as The Doctor in this movie. Bernard Cribbins comes on board and is fantastic. Ray Brooks and Jill Curzon enhance the swinging sixties fell apparent in the previous film, and the action never gives up. The multi coloured Daleks are a more frightening sight in a future decaying London thatn on there own planet, and the set designs and designs of the vicious Robomen are again superb. This is a juvenile movie, but enjoyable at that.